Third game in six days will be a tough one up at Boro. We need to play to our strengths and try get back to the composure we showed at Derby. Hopefully McGinn will be a bit fresher. No Hutton so Elmo will come in (which I’m happy with as I think he’s our strongest RB). Boro have some big boys so I expect a tough game for our defence. We looked very vulnerable against Forest and need to ensure our defence has adequate protection from the midfield. That was the case at Derby and mean we stifled the opposition’s attacks and could counter well. Can’t see DS changing the team so I expect the start starting XI from midweek (with Elmo for Hutton). Let’s go at them and play to our strengths. I’d take a draw, but we can’t draw too many, as we will start falling behind. Boro are good at the back, and we are great going forward. Boro are a bit toothless upfront, and we are poor at the back. Smash and grab win??? If he was available, I’d be tempted to start Jedinak in DM as we’re struggling with defending set pieces and let’s face it, it’s a Pulis side. All I know is I have **** all idea on how this will go. That in itself is quite exciting. Corners, as ever, will be a big problem for us in this game. Best hope is to dominate posession and outscore opponent. 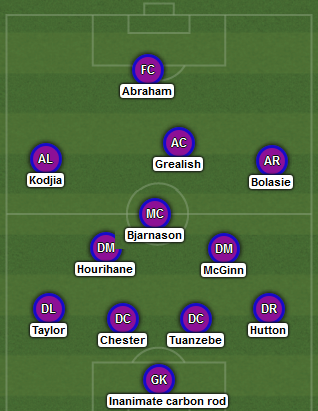 Only thing we can do until Jan.
Jedinak for Conor to sit infront of the defence, need extra protection and height to defend against Pulis' only tactic. I think we can win but a lot needs to go our way. Hooefully ill be pleasantly surprised just like our last away game. I know where youre coming from as theyre decent, but everytime we draw a game it means we need to win an extra match, in effect. I might take a draw if we were first or second in the league. Also, we usually do pretty well up there from recent memory. So no reason not to win. Out score them Villa. Right, where do you start? Apart from Forest, Boro are the other side who've only lost twice this season (to Forest & Norwich). They're unbeaten in 7 and sit 6th in the home table. They rank 19th scoring goals at home (10) but they rank 1st in conceding goals at home (3). So it's no surprise that games involving Middlesbrough rank 24th and bottom in total goals, and games at the Riverside the same. As a couple of other posters have mentioned, I too would be tempted to start with Jedinak for his aerial presence, if he is fit and available for selection. Boro started Tuesday's game at Preston with Flint, Ayala, Batth, Hugill and Gestede all in the starting eleven, these are all six-foot plus and I worry that we will not be able to cope with the many set-pieces you can expect from a Pulis team. To be fair Gestede came off injured at Deepdale, so he probably won't start, but that means Assombalonga will and he's no doubt the better player and will cause us different problems to Rudy. Would probably have taken a point if offered prior to last night's game, but with two dropped points, we really could do with all 3, with the baggies next in line. Possibly the worst game we could get with the state of our defence! Win this one and i start believe. I'm gutted Birkir got injured. Really liked what i saw from him the few minutes he got under Smith.